Scholastic sent me a great book I’d love to share with you called “The Big Beet” by Lynn Ward and Adam Carruthers. It is a progressive story that communicates that if we all pull together we can achieve great things! It’s RRP is $24.99, it was published in Aug 2013 by Omnibus Books for Scholastic Australia. “The Big Beet” is bright with eye-catching artwork. It’s fun to read aloud, my kids loved it and really got entranced in the story, wondering how the beet would finally get pulled out of the garden. They really loved looking at all the little critters living below the ground with the beet. Thelma Magee fancies a burger for tea, so her husband Bert heads out to the veggie patch to pick a juicy beetroot. But no matter how hard he pulls, that beet won’t budge. He might need a hand… It’s a distinctively Aussie version of the Russian traditional tale, “The enormous Turnip.” I love the Aussie characters, especially Shazza and Dazza! You can’t get more Aussie then that! As soon as I read this, I knew that we just had to plant some beets in our veggie garden! Unfortunately it took quite some time to arrange a trip to buy the seedlings. I’m a little scared at growing vegies from seed in the ground. I need to bite the bullet and do it. I think the last time I did, the ground was too hard, but our veggie garden at our new house has lovely soft soil. Mum arranged for some sample packs of vegetable seeds, so as soon as I weed the garden, (hopefully next week…) I will have to get planting. Anyway, back to beetroots! Finally Miss Rachael and I went to Masters. The kids loved the twin trolleys, although they were a bit tired, and some were more grumpy then others, (as you can see below, starting from the moment we arrived!) so our trip was a bit shorter than what it could have been. We had never been to Masters before, and we had fun exploring it. The Accountant had a grumble at the money I spent, but it really wasn’t that bad. Accountant’s need to have these type of grumbles from time to time. You learn to ignore it. We still have a handful of paint chips that we are going to do some art with. The most important things was that I bought a variety of vegetable and herb seedlings and took them home to plant. The garden is my domain. I’m not incredibly good at it, but I do like having a potter around in there. My biggest issue is sticking with it. At the moment it’s become overtaken by weeds. I discovered the programmed timer for the sprinkler, and then abandoned the garden for a few weeks when I hit a busy patch. Whoops. I think the first week of the school holidays we will spend a lot of time there. This time I will use mulch in an effort to have less weeds in the future. It’s good to teach children about where their food comes from, so the veggie garden is a great opportunity for plenty of lessons. When we planted the beets, I made reference to “The Big Beet” story, wondered what creatures might be crawling around in the dirt, and hoped that none of those pesky rabbits would invade our gardens. There is a possible visitor to our beets. Recently The Accountant spotted a python in our garden – a very large python. I hope I never see the old fella. I hate snakes. Even harmless ones, after all, if it bit anyone, it would still hurt! It was a good reminder to teach our children snake etiquette, which we do frequently, especially now that we live on a farm. I’m fairly confident that a snake wouldn’t bother us while all the kids are in the veggie garden. They are far too noisy. I rely on the fact that snakes don’t like human contact, but even still, we’ve taught our kids to be very still if there is a snake and then walk in the opposite direction to where the snake is moving and get an adult. At least having a python lurking around will decrease the rodents in the patch. Although I’m not happy that there is something else down there eating my broccoli before it has a chance to grow. I knew that Miss Rachael doesn’t have a whole heap of gardening experience, but unfortunately I forgot to tell her to check if the beets would be ready to pick if the top of the vegetable was protruding from the dirt. See the tiny little beet that Immy is holding? That was the biggest beet of all. And the triplets picked the whole lot! So unfortunately, all our beets got thrown away and unlike Thelma and Burt we did eat canned beetroot on our burgers! So during the first week of the school holidays when I attack the garden, I’ll also plant a new crop of beetroot and wait a lot longer before we pick them this time! 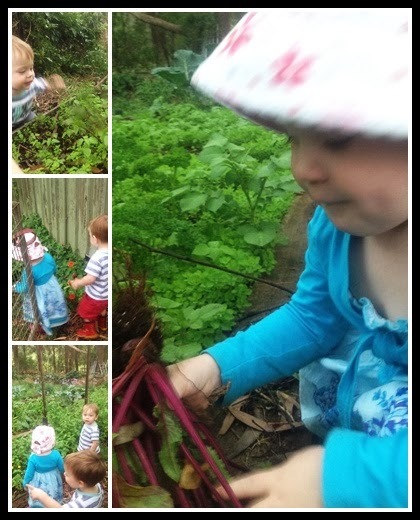 In any case, we had a lot of gardening fun inspired by a great children’s book! Do you have a vegie garden? Do you have snakes in your veggie patch? Or weeds? Right, back to the garden tour. If you missed the start of the tour, you can catch up by having a glance at my front yard . If you are an avid gardener, and didn’t read my first warning, click on that same link, or read the title again. This is not the advice of a gardening guru! I love my vegie garden. It’s a little overgrown at the moment and badly in need of a weed. I’m waiting for it to rain. It makes it much easier to pull the weeds out, especially when you have as many as I have cultivated at the moment. The plant blocking the path at the front is rocket. Advice for the clueless: Rocket doesn’t taste very nice when it’s left go wild as such. Very bitter. I have to work out how to keep it under control… In fact I’ve planted a new punnet, because I think I may just have to pull these bushes out. The masses of greenery on the fence is our passionfruit vine. It has been awesome. We have got so much black passionfruit from it. More advice for the clueless. Passionfruit vines love to spread. I have four garden beds in my vegie garden, and planted the vine there. In one year it has covered the cute garden seat in between the two beds, and completely taken over the 2nd trellis where I had cherry tomatoes growing. I’ve now got cherry tomatoes intermingled with passionfruit. It’s a bit crazy! Another gardening tip: Cherry tomatoes are FANTASTIC to grow! (Providing they don’t have to compete with the passionfruit.) Last year I got a punnet of seedlings and got a bumper crop from them. Really easy to grow, heaps of fruit and no disease! Much easier than normal tomatos. They hardly produced any fruit and the fruit I did have had blossom end rot. I know people say growing tomatos is easy, but if you are gardening challenged, start with cherry toms. Plus, it is always satisfying walking past them in the supermarket and feeling smug that you have hundreds of them at home for the same price as a punnet would cost! The above picture is some advice for the clueless. This will be what your broccoli looks like if you don’t pick them immediately. If you think, “I’m not having broccoli for dinner tonight, I’ll pick them later…” you may come back several days later to discover them looking like this. The bees will love it, but you won’t. The same applies to cauliflower. I have this love of cooking it straight after picking. I have all these visions of extra nutrients nourishing my families body when I do this. This shot is before my theory backfired, I left the cauliflower in the garden too long and it went a frightful yellow. I don’t know what’s wrong with my cauliflower in fact, it took ages to grow and I’m sure the leaves aren’t supposed to be this big. Four years ago The Accountant and I were tossing up whether to buy or build a house. One of the reasons we decided to buy a house, was that it would come with established gardens which would be a bonus for us because we aren’t great gardeners. Subsequently we bought a newly built house with no gardens. Hardly any lawn for that matter. Humph. So, slowly but surely we have getting the yard in order. As you can see from the front or our house, it has gardens, but it doesn’t look like the house of mad keen gardeners, hopefully it’s apparant that at least we try! This may take a few posts, but I’ll take you for a tour around our yard. I’ll show you the good the bad and the ugly! Are you ready? The driveway. My multi-talented Accountant put up our black fence. (Measured very exactly) I had a bit of dirt in between the driveway and the fence, so I planted liriopes in that gap. Mainly because they were said to have purple hycianth like flowers. They do fill the space nicely and look lovely and green, but in the last three years they have only flowered once. Garden next to the front door. I love the big cycad. It was from my grandfather’s house, so has a sentimental component too. Unfortunately we have a dog. He is not helpful in the garden at all. He digs. This is one of his favourite spots. Therefore, this spot is often in disarray. Truly unfortunate for an entry garden. The clivias are very hardy plants, and most have survived many transplants, however, probably could be repositioned, but I don’t have the heart to move them until after they flower, which they haven’t done since they’ve been in that spot. The other side of the entry. 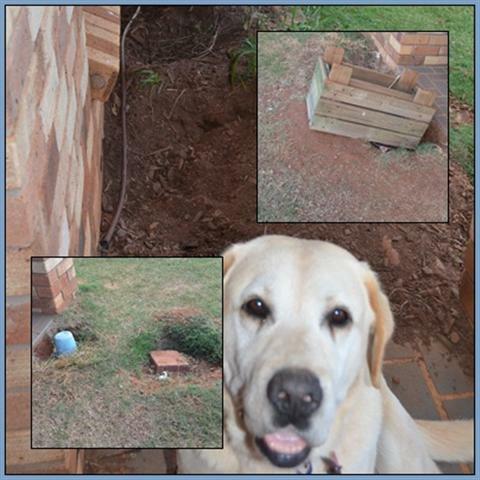 The dogs absolute favourite digging spot. I have recently planted all the plants except the cordyline. The dog has already killed several. He likes to dig a hole and sit and wait for us to get home. He doesn’t listen when I suggest digging a hole near his kennel. I might have to get a better picture. This was taken in the wrong light. It was early in the morning and I was outside with The Baby trying to distract him from waking the rest of the household. I love the blue pot planters. They were a gift from my mother. I also love the pink cordylines that I recently found. You can’t tell they are pink. They make a great contrast. I bought one plant, then realised it would be great in that pot. Sadly the pots had been empty for well over a year since the last cordyline was transplanted to the front garden. The first plant was starting to look scrappy, but was still bigger than the other plant by the time I finally got back to buy a second plant. Hopefully they will start looking more similar sometime soon. Fingers crossed!